This study tour offers a unique opportunity to learn from, experience, and interact with an isolated Himalayan community that few Westerners have visited. Bhutan is a Buddhist kingdom where the last king proclaimed himself more interested in “gross national happiness” than gross national product; where vegetation and wildlife are preserved in woodlands and reserves that cover some 70% of the country; where ancient Buddhist rites of medicine, healing and meditation are still practiced; where famous monasteries hang from cliff faces; and where snow-laden Himalayan pinnacles reach to the heavens. As a professional group of therapists, we have been granted permission to visit temples, sit in on ceremonies, and interact with “a great deal of traditional medicine, doctors and Buddhist meditation masters who practice healing in various ways.” We go at the best time of the year for clear visibility of the high Himalaya and the chance to participate in a local festival to welcome the engangered black-necked cranes. The temples, mountains, natural beauty, and people make for wonderfully stunning photo opportunities. Our previous tours, George's numerous visits there over the last twelve years and his three terms as a volunteer clinical psychologist in Bhutan, have enabled us to assess the best places to visit in terms of our study goals, and to meet some well-informed and influential people who are only too willing to share their knowledge and skills with us. George Burns, will share with you a much-loved part of his world. With more than twenty visits to the Himalaya in India, Nepal, Tibet and Bhutan, he is as familiar with the environment as he is with the culture, religion and traditional practices of healing. George is a clinical psychologist, therapist trainer, adjunct professor of psychology, author of seven professional books, and international lecturer. In 2012 he was invited by the Prime Minister of Bhutan to participate in a High Level United Nations Meeting about creating a world developmental paradigm based on happiness rather than economics. He will bring the richness of his clinical experience, the passion of his life as an adventure traveller, and the skills of his warm, pragmatic teaching style into this once-in-a-lifetime learning opportunity. Arrive Bangkok. Afternoon at leisure. Our 5pm group meeting and tour briefing is followed by a traditional Thai dinner. 0400 Arise and shine! 0650 Fly Bangkok-Paro. Arrive 1025. We will meet our Bhutanese guide, then drive to Thimphu, the capital of Bhutan, along steep, farmhouse-dotted river valleys with several sightseeing stops. In the afternoon we visit Big Buddha (claimed to be the world's biggest) before having time to familiarize ourselves with the capital, wander its streets and enjoy cultural atmosphere. In the morning we pay a visit to a substance abuse agency sponsored by the Fifth King and the national hospital where we meet with Bhutan's senior psychiatrist to discuss his unique work of blending Eastern and Western approaches to psychiatry. In the afternoon we get to see Bhutan's national animal, the taxonomically baffling Takin, before a gentle and beautiful scenic stroll above the Thimphu valley with views of the National Dzong (seat of the king and monk body). We begin the day with a cultural tour, taking in such places as Zorig Chusom (the arts and crafts school), Traditional Medical Institute, National Library, Post Office (famous for its stamps). Following this we visit Bhutan's women's agency, RENEW, and the centre for Bhutan Studies to learn about the concept of Gross National Happiness. The morning allows time for exploring the capital a little more, perhaps joining locals at the city markets. After lunch we depart on a scenic drive to the 3150m Dochu La pass. It is hard to imagine a better spot in the world to enjoy some self-hypnosis, meditation, or nature-guided mindfulness among a forest of fluttering prayer flags overlookinig the world's highest mountains. We will overnight at the top of the pass hoping for a sunset across the Himalayan peaks (if the weather is kind) while dining in a galley that has us surrounded by the works of one of Bhutan's most acclaimed artists. We take yet another scenic drive, this time to the unique Phubjika Valley, home fo the rare and endangered black-neck crane, maybe spotting our first yaks on the way. Tonight we bed down, dormitory-style on the floor, with a local farming family in their valley farm house. Please note: our agent appropriately describes this accommodation as 'rustic' and while the facilities are very basic, participants have previously rated this as one of the highlights of the trip. This morning we have the chance to join the people of the Valley in a local festival, to celebrate the arrival fo the black-neck crane. 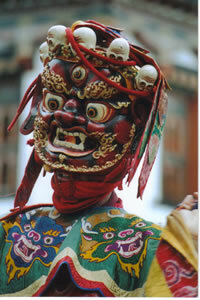 This is one of my favourite Bhutanese tsechus (masked dance festival). It is colourful, local, homey, less touristy than the big festivals, and still representative of this important cultural event. In the afternoon we drive to Punakha. This morning will see us driving to Paro, again crossing Dochu La with another chance to view the Himalaya before travelling along the Wang Chu and Parchu River valleys. In the afternoon there is the opportunity to explore the quaint town of Paro, wander its old-worldy streets, and perhaps do some last minute shopping in its many fascinating stores. This morning we meet with a high order lama to receive some teaching in Buddhism and meditation. In the afternoon, we take a walk to a historic and unique cliff-hugging village that few other tourists get to explore. Today we hike to Taktshang (Tiger's Nest) Monastery, one of the most revered Buddhist sites in the world. It is to here that Guru Rinpoche (the second Buddha) is said to have flown across the Himalaya on the back of a flaming tigress, bringing the Buddhist teachings to Bhutan. Hanging precariously from the face of a 900m cliff, it is a sight one must see in this lifetime. Before dinner we have our final meeting. We are scheduled to depart Shangri-La, arriving late afternoon in Bangkok. By this stage you will probably have relaxed into the time-free lifestyle of Bhutan and, so it seems, has the national airline. Delays are likely to be the norm rather than the exception. While we are scheduled to arrive Bangkok at 1740, I strongly recommend you plan at least one overnight stop in Bangkok (by your own arrangements) to ensure you make your onward connection. Depart Bangkok for home and/or other adventures. Visa fees ($US50) for Bhutan, departure taxes (approx $US50), festival entries. Single accommodation: $US TO BE ADVISED extra. While single accommodation must be booked and paid for in advance, it cannot be guaranteed. NB: Prices quoted are current at the time of printing but subject to change. Accompanying Persons: Are welcome to join the tour at the per person costs above. Booking: Bookings should be made on the attached Booking Form. Please note: places are strictly limited due to availability of accommodation, flights and desired group size. In the past these tours have filled quickly and we have not been able to offer places to everyone who wanted to go. There are many people on this year’s ‘interested list’ so please ensure you book early to avoid disappointment. To be fair places will be allocated on a first-come-first-served basis of received deposits.